Here's the deal on the Bloomberg Moment: It has the potential to be yet another ephemeral piece of data in the byte stream on the modern perpetual campaign — or a significant and historic factor that will undermine the two-party duopoly that is now held in very low regard by American voters. It's that simple. The outcome -- the ultimate Bloomberg Terminal -- depends largely on whether we monsters of the media focus only on the horserace — the ephemera — or on the message. And what the media does will be largely determined by how the political elite, especially the nonpartisan elite, responds to the Bloomberg Moment. Will the third-party vehicle called Unity08 find a way to align with Bloomberg? Will a community of zealous, energetic, resourceful and smart bloggers who aren't rabid red or barking blue emerge and engage with the Bloomberg Moment? Can the middle ignite intensity and Web 2.0 wattage, or just the extremes? Will apolitical or, rather, un-partisan, public figures — businesspeople, ex-soldiers, academics, leaders of non-profits and that sort — find a way to contribute? Will marginalized politicians, people who no longer fit well in their parties, join up, people like Chuck Hagel, Bill Bradley, Warren Rudman, Sam Nunn, Joe Lieberman or Arnold Schwarzenegger? If some of these things happen, the press corps will probably notice. Full disclosure: I have been pushing for a Bloomberg third-party run in this column for ages. 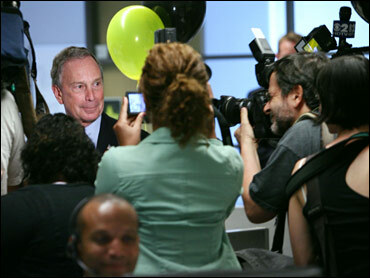 To be more precise, I have been pushing for the idea of a Bloomberg candidacy for ages. I have become convinced that only a successful third-party movement has a prayer of fiddling with the governmental paralysis inflicted on this country by the both the two-party duopoly and the system of perpetual campaigning it has created. Believe me, I am aware of how much of a pipe dream a real third party is. I also became convinced that Michael Bloomberg was the only person who stood any chance of running a successful independent campaign in 2008. He's not the only smart, pragmatic centrist in town — but he's the only with experience and success in high government office who can write a check and instantly fund a serious campaign. Will Bloomberg run? Well folks, he will or he won't; sorry, it's not brain surgery. I wouldn't shed a whole lot of ink over it right now, because the mayor likely has not decided yet himself. If he had no desire at all, he wouldn't have formally left the GOP. But he probably also wants to have a better idea of who he might be running against before he makes a decision. If Bloomberg runs, can he win? Again, it's either yes or no. Roughly 95 percent of the punditry will say an independent cannot possibly win the presidency in the United States of America, but they'll add an "anything is possible" Pamper-clause. My view is that if Bloomberg runs, he will be the favorite, for what it's worth, which isn't much. Assuming, as we must since we're smart, that Bloomberg can't win, who does he hurt the most? The standard answer is he hurts the Democrats the most, unless Rudy Giuliani is the Republican nominee. I'm fine with that. But it's hard to tell now, not knowing who the nominees will be or what mega-news events might occur in the next year or what scandals lurk in the candidates' closets. My interest is in what potential this Bloomberg Moment has to inspire serious change in the two-party dynamic over time. Obviously, if Bloomberg wins, it's a whole new political world — and a better one in the long run, in my view, no matter whether his administration has clear success or not. It is extremely likely that a third-party win would be a one-term flash in the pan. The rigid stagnation of the third-party system in America since the Civil War is an aberration compared to Europe and even prior American history. Party systems do change. If Bloomberg runs and loses, the effects could still be profound. If he does well (better than expectations), he could try again or spawn more deeply-rooted independent campaigns in the future. It could inspire credible, well-financed independent candidacies for Senate seats and governors' mansions and perhaps an actual party organization. His candidacy could even, just maybe, influence the climate of how government business is conducted after the inauguration in January 2009. Perhaps there would be serious bipartisan cabinet appointments. If a kook like H. Ross Perot hadn't snagged 19 percent of the vote in 1992, Michael Bloomberg probably wouldn't be pondering a run in 2007. Things take time. So who knows what might happen if Bloomberg ran and got 30 percent and some electoral votes. And if the mayor is just flirting and decides not to go all the way? That is, after all, the most likely outcome. Perhaps other serious people around the country will give serious thought to the serious, perhaps lethal flaws of the current duopoly and give serious time and money to solutions. It's even hard for a third-party pipe dreamer like me to find a silver lining in the no-go scenario. But here's one: On the Fourth of July, Mayor Bloomberg should pledge a gift of $1 billion to Unity08 if he doesn't run for president in 2008. That'll show 'em.